We’d love your help. Let us know what’s wrong with this preview of Den vita vägen by Edmund de Waal. Extraordinary new non-fiction, a gripping blend of history and memoir, by the author of the award-winning and bestselling international sensation, 'The Hare with Amber Eyes'. In 'The White Road', bestselling author and artist Edmund de Waal gives us an intimate narrative history of his lifelong obsession with porcelain, or "white gold." A potter who has been working with po Extraordinary new non-fiction, a gripping blend of history and memoir, by the author of the award-winning and bestselling international sensation, 'The Hare with Amber Eyes'. In 'The White Road', bestselling author and artist Edmund de Waal gives us an intimate narrative history of his lifelong obsession with porcelain, or "white gold." A potter who has been working with porcelain for more than forty years, de Waal describes how he set out on five journeys to places where porcelain was dreamed about, refined, collected and coveted - and that would help him understand the clay's mysterious allure. From his studio in London, he starts by travelling to three "white hills" - sites in China, Germany and England that are key to porcelain's creation. But his search eventually takes him around the globe and reveals more than a history of cups and figurines; rather, he is forced to confront some of the darkest moments of twentieth-century history. To ask other readers questions about Den vita vägen , please sign up. Description: In The White Road, bestselling author and artist Edmund de Waal gives us an intimate narrative history of his lifelong obsession with porcelain, or "white gold." A potter who has been working with porcelain for more than forty years, de Waal describes how he set out on five journeys to places where porcelain was dreamed about, refined, collected and coveted--and that would help him understand the clay's mysterious allure. From his studio in London, he starts by travelling to three "white hills"--sites in China, Germany and England that are key to porcelain's creation. But his search eventually takes him around the globe and reveals more than a history of cups and figurines; rather, he is forced to confront some of the darkest moments of twentieth-century history. Part memoir, part history, part detective story, The White Road chronicles a global obsession with alchemy, art, wealth, craft and purity. In a sweeping yet intimate style that recalls The Hare with Amber Eyes, de Waal gives us a singular understanding of "the spectrum of porcelain" and the mapping of desire. As a ceramicist who has worked with clay for the past 25 years creating slender and delicate pots, all things white are an passion for de Waal. This book is a physical and spiritual journey to the places and origins of these materials that fuse together to create the translucent, ethereal material that is porcelain. His desire is to hold the raw materials in his own hands, to climb the hills where the white earth is dug from, to possess a pot made that place. China was the place where porcelain w As a ceramicist who has worked with clay for the past 25 years creating slender and delicate pots, all things white are an passion for de Waal. This book is a physical and spiritual journey to the places and origins of these materials that fuse together to create the translucent, ethereal material that is porcelain. His desire is to hold the raw materials in his own hands, to climb the hills where the white earth is dug from, to possess a pot made that place. China was the place where porcelain was invented; the fusion of two materials kaolin and petuntse after purification, blending and firing at 1300 degrees brings forth this glass like substance. His pilgrimage starts in the city of Jingdezhen, centre of porcelain for 1000 years, but best known now for its helicopters. Modern China is an intense place, I know I have been there, and as he finds his way around the city avoiding road traffic, he realises that the city seems to built on broken pottery, stooping he picks up a 12th century shard laying on a spoil heap. All around the hillside are kilns, and the failed firings are just tossed away. This city produced thousand upon thousand of pieces of pottery for the Emperors, the final order being taken shortly after the turn of the nineteenth century. They are still making porcelain there, but not in the volume they used to, and he is there to source tiles for an exhibition too. And so to Germany. A young alchemist called Böttger claims to have found the secret of changing other metals into gold. He couldn’t. Held in prison, he works alongside a mathematician called Tschirnhaus, and after many failures they manage to reveal the secret of making porcelain like the Chinese. Soon after producing this single white cup, Tschirnhaus dies. He wasn’t able to make gold, but the discovery of this white gold changes the fortunes of many in Europe. One inventory details a few hundred pieces of porcelain, the last time it was counted was over 35,000 items. De Waal heads home to England, in pursuit of his final white hill. As the English potters scour the countryside in search of this white clay, necessitating a trip to the land of the Cherokee in America, the find the materials just down the road in Cornwall. Plymouth becomes the third place in the World to produce porcelain around 1000 years after the Chinese first achieved it. This book is a blend of genres; part travelogue, part history book, semi auto-biographical and full of whimsy and occasionally random thoughts. There are accounts of his art installations and exhibitions, his first workshop on the Welsh border, his angsts of the creative process, the collectors and guardians of exquisite pieces of pottery and those that have made and lost fortunes with this white gold. But much more than that, this is an account of his obsession with porcelain. This is a really unique book. When you first start reading it, you think it is just about porcelain (this is of a lot of interest to me, as both of my parents used to be potters), but, once you start reading the book, it turns into so much more: history, a bit of a mystery, and more. It deal with a lot of issues, and I like how the book blends several genres into one. Well-written, interesting to read, and kept me turning the pages, wanting to know more. Author of The Hare With Amber Eyes potter Edmund de Waal's new book on the history of porcelain. Episode 2/5: The author travels back in in time to Dresden and explores the dramatic events which led to the creation of European porcelain. Episode 3/5: Imprisoned in Meissen castle, young alchemist, Johann Freidrich Bottger, is about to unlock the secrets of porcelain creation. Episode 4/5: The author's pilgrimage to the lands and people who make porcelain takes him to Cornwall where he explores William Cookworthy's contribution to porcelain's history. Episode 5/5: The author's pilgrimage to the lands and people who make porcelain takes him to Dachau where he uncovers the dark history of Allach porcelain. What's wrong with this one? It's not the porcelain as a subject - I find it fascinating. But the build-up of the book doesn't work for me and where in The Hare, his incredibly beautiful and poignant language floored me with admiration, in this one it annoys me because it seems so forced. I'm sorry Mr. De Waal, but I do hope you write another book some time. I will buy it, hoping hoping hoping that it's another Hare. After reading De Waal’s The Hare with the Amber Eyes I was intrigued to read this book on porcelain. I know he is a potter, I’ve looked up his work. It’s good, very plain, but very beautiful too. This book is about the history of porcelain, where it comes from and why white is so attractive to us. For the most part it’s quite an interesting read. But there are parts that can get a bit boring. Unless you are a massive porcelain/pottery fan, I think most people would find it hard going. I really e After reading De Waal’s The Hare with the Amber Eyes I was intrigued to read this book on porcelain. I know he is a potter, I’ve looked up his work. It’s good, very plain, but very beautiful too. It had been a while since I had read a good non-fiction and I am very picky when it comes to this genre. The book has to be a solid one or I will just drop it and not read further. Life is too short to read badly written books. I loved Edmund de Waal’s earlier book “The Hare with the Amber Eyes” (Please read it if you haven’t already. Trust me, you will love it as well). This is when I received his new book to read “The White Road: Journey into an Obsession”. How does one describe this book? The It had been a while since I had read a good non-fiction and I am very picky when it comes to this genre. The book has to be a solid one or I will just drop it and not read further. Life is too short to read badly written books. I loved Edmund de Waal’s earlier book “The Hare with the Amber Eyes” (Please read it if you haven’t already. Trust me, you will love it as well). This is when I received his new book to read “The White Road: Journey into an Obsession”. How does one describe this book? There is a lot going on in it, but I shall try and make sense of it. When I plucked this lovely looking book* from the shelf in the bookshop I assumed, for no accountable reason, that it was a novel. I realised my mistake as soon as I started reading, but within a couple of paragraphs I was completely hooked. Who could possibly imagine the history of porcelain to be so interesting? A marvellous book, full of historical information and fascinating anecdotes. De Waal's enthusiasm and passion for his subject is undeniably infectious, despite the fact that reading th When I plucked this lovely looking book* from the shelf in the bookshop I assumed, for no accountable reason, that it was a novel. I realised my mistake as soon as I started reading, but within a couple of paragraphs I was completely hooked. Who could possibly imagine the history of porcelain to be so interesting? A marvellous book, full of historical information and fascinating anecdotes. De Waal's enthusiasm and passion for his subject is undeniably infectious, despite the fact that reading this book is as close as I'll ever come to throwing a pot of any kind! You don't have to be a ceramic artist to relish this book, but it probably helps. I savoured every page knowing that as I turned each one, I would be re-reading it at least one more time in order to squeeze more value from it. Oh for more books of this ilk! A most interesting whip round the history of porcelain making. The author travels to China to the White Hills to continue his obsession with porcelain. Glad I chose this book. Not really what I would have picked but I saw the author on Sunday Morning and I became interested then. The white road of the title is the tale of the authors trek across several continents on the trail of porcelain. Along the way we meet those at the heart of this great story - Augustus in Dresden, Cookworthy in Plymouth, Wedgwood in Stoke - and the history of this substance against the background of events. The struggle to make porcelain in Nazi Germany. In the GDR. In Mao's China. A wonderful saga that should enthral even those like me with no knowledge of porcelain. I am, like the author, a massive fan of porcelain. I too ask the question 'who could not be obsessed with porcelain', apart from James Joyce (apparently) and 'most people' that is. I believe, of course, that people just haven't yet had the chance to learn, as I have, what the mystery of white is all about. Which is why I take the chance to lift plates to the light, in private or public, to remind myself of the art and science that makes a plate. Nature's detritus, transmuted into treasure, a kin I am, like the author, a massive fan of porcelain. I too ask the question 'who could not be obsessed with porcelain', apart from James Joyce (apparently) and 'most people' that is. I believe, of course, that people just haven't yet had the chance to learn, as I have, what the mystery of white is all about. Which is why I take the chance to lift plates to the light, in private or public, to remind myself of the art and science that makes a plate. Nature's detritus, transmuted into treasure, a kind of white gold. China, the original materials and porcelain, the dignity of copying, a world somehow the same as it has always been despite the rolling revolutions that have gone on around it. Decadent Dresden, alchemy and order (more inventories but complete ones perhaps? ), the copying going westward rather than the modern eastward trend. Plymouth and the birth of English porcelain, Puritanism, patents and competition with wedgwood's pottery - the unfortunate story of innovative perseverance left unrewarded. Tennessee and Cherokee Indians clay and finally, the saving art of porcelain in concentration camps. I found this book lost its zing as it went on. I did accelerate my reading as I grew more interested, and the writing probably requires more patience than I gave it. It's hard to read the story as it leads to the big exhibition and not have the chance to see it - even the pictures of it in the book are limited, although the effect is no doubt only captured by the live scene. I was expecting that more of the secrets of bone china and pottery stone might have been revealed, but I'm glad they weren't - some secrets of my own to enjoy and perhaps write about myself. Edmund de Waal made his literary mark with The Hare with Amber Eyes (2009), a very readable narrative of his family history set in Paris and Vienna, taking the family netsuke collection as its anchor. Having enjoyed the earlier book, I approached this one with high expectations. However, The White Road is quite a different beast. It is incredibly diffuse, both thematically and in its prose. Without the very specific anchor of the netsuke, de Waal seems to drift from one alluring topic to the next Edmund de Waal made his literary mark with The Hare with Amber Eyes (2009), a very readable narrative of his family history set in Paris and Vienna, taking the family netsuke collection as its anchor. Having enjoyed the earlier book, I approached this one with high expectations. However, The White Road is quite a different beast. It is incredibly diffuse, both thematically and in its prose. Without the very specific anchor of the netsuke, de Waal seems to drift from one alluring topic to the next, without offering much in the way of structure or argument. He covers Jingdezhen. Meissen. Wedgwood. Dachau. He visits everywhere that he writes about. He writes everything up in a somewhat breathless present tense, even the historical parts. In the background, he tells the story of his own career as a potter. Again, the telling is kind of piecemeal, but I found this material fascinating – the journey from his earliest work (nobody would buy it) to his bespoke installations for museums around the world. The copy I bought in the UK was called The White Road: A Pilgrimage of Sorts, whereas the US edition has the slightly scary title The White Road: Journey into an Obsession. In fact, I think the US edition has the better title, because it acknowledges that this book is more than a porcelain travelogue, it’s very much his autobiographical journey too. Definitely recommended, but be prepared for something long, rambling and idiosyncratic in style, more like a script for a film documentary than an art history book. De Waal's second autobiography is to be read with your thinking cap on as he wanders through the history of porcelain in the five parts of the world where porcelain was discovered or invented, and he also reveals the working mind of a modern potter. To write this memoire, De Waal not only physically visits the sites where porcelain shaped lives, but he has the knack of intertwining the various steps which he as a potter personally follows whenever he has to create a modern pottery exhibition, into his journey down the white road. In this way the reader gets to know the history of porcelain, as well asj the mind of an internationally acclaimed potter. Very insightful, if daunting! As a bonus, De Waal also allows the reader into his innermost thoughts, often quoting from poems that showcase either whiteness or artists' obsession with their creative juices. 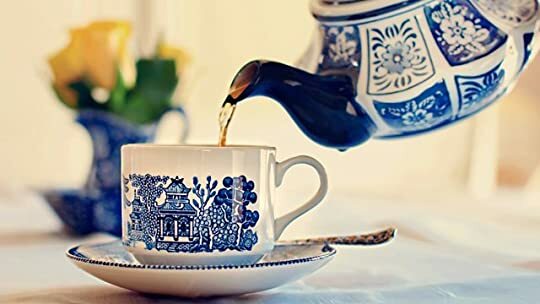 Knowing the intricacies of porcelain making, I will never drink from a fine porcelain cup or eat from a porcelain plate without added pleasure. De Waal's book 'The White Road' is only for people who love complexity and detail, who understand intense desire and who are willing to journey down 'The White Road' into obsession with him. The book explains the processes to harvest, refine and create the base materials from which porcelain is made, and also emphasises the cost of human labour in the process of making porcelain objects. The whole process literally takes years! Porcelaine's history starts more than 800 years ago in the town of Jingdezhen +-554km southwest of Shanghai as the right materials were found in the vicinity. De Waal follows in the footsteps of the Jesuit fathers and other adventurers who document China's white porcelain and are so enchanted by it that they write detailed reports to Europe. As recently as 1975, even Mao was flattered by the porcelain gifts sent to him. The second phase of De Waal's book takes us to Europe. As with much of history, chance plays a big role: French missionaries went to China, obviously to convert the Chinese. However, they wrote letters home elaborating on all they saw. The reports of the unknown translucent porcelain ware caught the readers' attention. The French Emporer of the time, ordered the 'Trianon of Porcelaine' to be built for his current mistress. The tower soon disintegrated, but the wayward young German Prince Augustus of Saxony saw it before it was demolished and decided that Dresden must also get into the porcelain game. It took the Saxons more than 20 years to eventually outstrip the French mediocre porcelain and the opaque Dutch porcelain. However, Augustus, now regent, was the original 'man of sin' glorifying himself. His wish to have porcelain created, took a backseat, yet eventually became an imperative to ensure his status. He imported thousands of Chinese porcelain objects. However, his lifestyle and a war or two, bankrupted him. Augustus ordered that his alchemist and mathematician should work together to make gold to bolster his failing finances. The laboratory (read prison) was moved from Dresden to Meissen. It was 400 years after Chinese porcelain reached Europe, twenty years after the mathematician's first efforts to create translucent porcelain, eight years after the alchemist was brought to Dresden to make gold and five years since working together on porcelain, before they actually succeeded to make translucent porcelain in 1708! They never managed to produce gold. Thirdly De Waal moves his story to England: 1719. Young Cooksworthy was a charity case who was to serve a six year apprenticeship in a Quaker apothocary. He loved to roam the countryside, where he saw the misery of miners. Cooksworthy charted the soils of Devon, read avidly and stumbled onto reports of porcelain making. He found suitable soils for porcelain in the countryside of Devon and spent the rest of his life working in porcelain as he was interested in people and their work. When his wife died, his grief transformed him and he became obsessed with porcelain. Various associates went into either business or competition with Cooksworthy. White soil was even shipped in from America! Cooksworthy was slow to realise that experimenting to make porcelain was vastly different from mass producing porcelain objects which required cobalt ornamentation and glazes that illuminated the porcelain. He also had other interests like desalination that distracted him from porcelain. Cooksworthy undersold his porcelain patent to Champion who in turn was outwitted by Wedgewood who was a self-centered ruthless businessman. Even today, we are all familiar with Wedgewood china! Next De Waal brings his readers to the crises experienced in early 1900 in Germany, Russia and China. So much had changed, yet the whiteness of porcelain remained an obsession. Perfection of mass production of porcelain became the hallmark of Germany's Third Reich. The Allach Porcelain Factory eclipsed all known porcelain works with its perfect figurines made by skilled artists - all inmates of Dachau! Himmler and Hitler were impressed! Finally, De Waal returns to the origin of porcelain: Jingdezhen in China. The city's human and natural resources were exhausted, but from the 1950s to 1980s, Jingdezhen was saved by Mao as there was a great demand for an officially sanctioned plaque of the 'great leader'. However, the factory city claimed many lives due to its inhumane working conditions. I was pretty certain that it would be difficult to top de Waal's last book, The Hare With Amber Eyes: A Family's Century of Art and Loss, which was my favorite book of 2012, but this book has certainly come close. de Waal, a renowned ceramicist, explores the various spots along the "White Road" of porcelain. The road takes him to China, Dresden, Meissen, Cornwall, South Carolina and Dachau, among other places, and in his travels he explores how the quest for the perfect white influenced the hist I was pretty certain that it would be difficult to top de Waal's last book, The Hare With Amber Eyes: A Family's Century of Art and Loss, which was my favorite book of 2012, but this book has certainly come close. de Waal, a renowned ceramicist, explores the various spots along the "White Road" of porcelain. The road takes him to China, Dresden, Meissen, Cornwall, South Carolina and Dachau, among other places, and in his travels he explores how the quest for the perfect white influenced the history and people of each place. I love the feel of this book, the delicate marks inside on the pages and his chapter titles and paragraph divisions. It is beautifully assembled and part of the pleasure of reading this book is the physical aspect of holding and seeing it. All which would be completely absent were it to be read digitally. His story meanders which only caused my mind to wander about halfway through, more my fault than the author's. A very soothing and meditative read. A lovely cover and I also thought the black & I love the feel of this book, the delicate marks inside on the pages and his chapter titles and paragraph divisions. It is beautifully assembled and part of the pleasure of reading this book is the physical aspect of holding and seeing it. Wonderful, but I wonder if having read The Hare With Amber Eyes: A Family's Century of Art and Loss first was what made this seem a little self-conscious at times; EdW trying very hard to write consistently like EdW, and telling us aaaaaall about it too, down to his coffee consumption affecting sentence length. I did not enjoy this as much as The Hare with Amber Eyes. It took me a long time to read this book, I dipped in and out of it as I found it quite slow and disjointed. It was interesting though I did not feel particularly engaged by the book. another masterpiece by de waal, chronicling the history of porcelain in china, france, germany, and england, and his obsession with it as his own art making and its essence. de waal is that good, to write about netsuke, and now 'pottery' with care, for the object and for the reader. Patchy. At its best engages history and reflections on the making of porcelain well. At its worse degenerates to disconnected dot points. Surprisingly the British history is the least well written aspect of the book. Needed lots more illustrations. Those used were not especially apt. Abridge audio from BBC radio. Quite interesting but far too brief when abridge. Bottiger sounds like an interesting person that I would love to read more about. The White Road is a passionate, digressive history of porcelain, the prized white pottery formed by clay first found in Jingdezhen, China more than 1,000 years ago. As Chinese porcelain started to come onto European markets, kings, royals, and rich collectors created a hunger for porcelain that led alchemists and other to try to find the secret to porcelain and make a European version. This led to the establishment of the famous factory in Meissen and, eventually, other in other Continental citi The White Road is a passionate, digressive history of porcelain, the prized white pottery formed by clay first found in Jingdezhen, China more than 1,000 years ago. As Chinese porcelain started to come onto European markets, kings, royals, and rich collectors created a hunger for porcelain that led alchemists and other to try to find the secret to porcelain and make a European version. This led to the establishment of the famous factory in Meissen and, eventually, other in other Continental cities. By the mid 1700s, the English wanted to find ways to make their own porcelain, as well. De Waal, the author of the remarkable family history The Hare With Amber Eyes, is obsessed with porcelain. A world-renowned ceramicist, he has been making porcelain objects for four decades. The Getty Museum has an excellent video of De Waal lecturing about on their website , and from watching it you can tell that he writes in the same manner that he speaks. He digresses frequently and he hops back and forth between the history of porcelain and his own memoir of researching this book. When his story is engrossing, when the characters that turn up in his history are fascinating, this tactic works well. But in the final third of the book, when he is tracing comparatively rather dull history of British efforts to create a home grown porcelain, this fell flat for me. De Waal is a good story teller and a proficient amateur historian. The search for the specific types of clay that would create porcelain required a combination of chemistry, geology, and geography, and so much of this book is really the story of amateur science in the centuries before science. Just when De Waal thinks he has completed his book, he accidentally stumbles across a reference to a twentieth century pottery he's never heard of before called Allach. Which turns out to be located in Dachau, Germany. And so in the final, short section of his book, De Waal recounts the little-known history of the production of the pottery company largely funded by Himmler's office, which produced both kitsch (cute animals) for general consumption and purely propagandistic figurines of heroic Nazi soldiers. After I read "The Hare With the Amber Eyes", I knew I stumbled on something truly promising and unique, even though I wasn't completely in love with the book originally. After constantly thinking about it, remembering de Waal's thrilling writing, I knew that I not only had to grab myself a copy, but I would also want to read whatever de Waal writes next. Now that I think of it, de Waal can be credited with my current fascination, and even obsession, with porcelain, which was accelerated by a cou After I read "The Hare With the Amber Eyes", I knew I stumbled on something truly promising and unique, even though I wasn't completely in love with the book originally. After constantly thinking about it, remembering de Waal's thrilling writing, I knew that I not only had to grab myself a copy, but I would also want to read whatever de Waal writes next. Now that I think of it, de Waal can be credited with my current fascination, and even obsession, with porcelain, which was accelerated by a course on Chinese decorative arts I took this past year. And if "The Hare With the Amber Eyes" both introduced and made me fall in love with netsuke, then "The White Road" gave me a more complete sense of the history of porcelain, as well as gave me a whole other slew of reasons why to love the colour white. A mixture of textbook history, biography, and prose-form poetry, it is significantly different from his first major book, and also more difficult to follow for readers who may either not know what to expect, or who may not be predisposed to liking porcelain before picking the book up. There were times when his writing felt a bit too rough and unedited, primarily in the beginning, but the fact that I was engrossed in the book and curious to know what he would say next is perhaps a sign that the style can be accustomed to. My only slight criticism was the way quotations were presented, namely the lack of citations that one might expect in such a heavily historical work, simply because it would've made it easier to refer to original source material that de Waal himself used. I would've much prefered a more complete citations list at the end as opposed to the vague short paragraph that refers the reader to his personal website for a list of materials de Waal found useful. The White Road is an exploration of making, a book in itself finely made. De Waal is first and foremost a potter, but he concluded that makers need to get out of their studios and workshops and write about the process and benefits of making things. The pilgrimage of the title is the quest for whiteness in porcelain. De Waal is searching for three bowls of perfect whiteness by criss-crossing a millennium’s worth of the journeys and experiments that led to them. He starts where porcelain started, in Jingdezhen in China, then tracing the messy European determination to figure out how the Chinese did it, zooming in on Germany and England but without entirely by-passing France. This is not the first time I have read a book by a maker that is better written than many books by writers. De Waal wields words beautifully to convey the obsessiveness and the physicality of making done with heart and imagination. He shows the humanity of some of the pioneers, the occasional randomness of alchemy and the haptic nature of knowledge. The White Road is a wonderful book which should resonate with anyone who tries to make anything worthwhile, in whatever form or medium. It is also a cultural history, a history of industrial development and a meditation on making and seeking. Don’t forget to give up on your lists when your quests take you beyond them. Edmund de Waal describes himself as a 'potter who writes'. His porcelain has been displayed in many museum collections around the world and he has recently made a huge installation for the dome of the Victoria and Albert Museum in London. Edmund was apprenticed as a potter, studied in Japan, and read English Literature at Cambridge University. 'The Hare with Amber Eyes', a journey through the hist Edmund de Waal describes himself as a 'potter who writes'. His porcelain has been displayed in many museum collections around the world and he has recently made a huge installation for the dome of the Victoria and Albert Museum in London. Edmund was apprenticed as a potter, studied in Japan, and read English Literature at Cambridge University. 'The Hare with Amber Eyes', a journey through the history of a family in objects, is his most personal book. “The connoisseurs sniff, categorise, rank, price, demote.